BARLOW Andrew PC 1982 BTP Fleetwood Testimonial When a car containing a driver and passenger fell into the mud of the harbour, PC Barlow attended and climbed down to the car to give the two unconscious occupants medical aid. 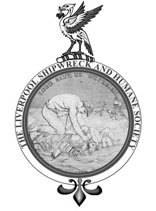 JAMES Michael PC 1924 GWR Birkenhead Silver Marine Gallantry Medal Awarded for the rescue of a 7 year old boy. LEWIS Percy PC (Rtd.) 1966 Testimonial At the age of 72, sprightly pensioner Percy Lewis dived into the Mersey and rescued a small girl who had fallen into the river. McNAUGHTON Tom PC 1958 BTC Fleetwood Dock Testimonial PC McNaughton jumped into the ice-covered waters of Wyre docks to rescue a drowning man. McNAUGHTON Tom PC 1972 BTP Fleetwood Dock Testimonial On 6th April 1972, the officer jumped into the Wyre Dock to rescue a drowning woman.